Hickory shad kick the season off in March with fantastic light tackle and fly fishing. 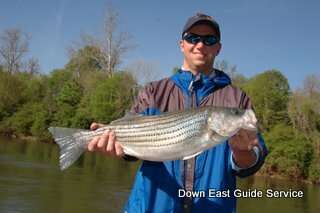 Striped bass arrive in early April. Lower Roanoke / Albemarle Sound offers year-round opportunities at triple digit days. 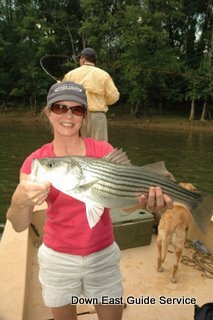 In the upper Roanoke the striper fishing peaks in mid-April and continues through late May, depending on water levels and temperatures. Keeper season is typically March/April and October/November. Anglers are allowed 2 fish between 18 and 22 inches/person/day. One striper may be over 27 inches. May is catch and release only. There is usually excellent top water action in the late afternoons and early mornings of May. Our Boats: 19-22’ flat bottom skiffs and bay boats which comfortably fish 2-3 people. License: A NC Freshwater fishing license is required. It can be purchased at most tackle shops, or call: 1-888-2HUNTFISH (888-248-6834). Tackle: Spin: 8-12 lb. test. Baitcasting: 12-20 lb. test. Fly rods: 8 wts with a 350-450 grain sink tip line depending on water level. Top water action begins in May. Single barbless hooks are required. All conventional tackle is provided. A selection of flies are provided for the long rodders. What to bring: Cooler w/drinks, sandwiches, rain gear, sunscreen. A fish cooler/plastic bags if you plan to keep any fish. Deposit Policy: To confirm reservations a $300 per boat/day deposit is due within 7 days. Deposits for reservations within 14 days must be secured immediately. Reservations not secured by deposits are subject to cancellation without notice. Deposits are not refundable, but are transferable if cancelled greater than 60 days from the date of the trip. 100% refunds for weather cancellations. Weather Cancellations are at the sole discretion of the captain. Rain is not a reason for a weather cancellation and we encourage you to bring rain gear regardless of the weather forecast. Eminent danger from lighting, hurricane warnings and conditions deemed unsafe by the captain are justification for weather cancellations. Any adjustments to the price of trips shortened due to inclement weather are at the sole discretion of the captain. Fuel Surcharge: Does Not Apply to this fishery. Just off I-95 at exit 173 in Roanoke Rapids, NC. 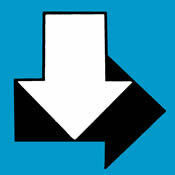 A number of hotels and restaurants are conveniently located here. To the launch ramp, take 158 E to 301, about 3 miles. The boat landing is located across the street from this intersection. We will meet you at the loading area, to the left of the landing. These are located right off exit 173 from I-95.